Sunderland manager feels that deleting his Twitter account was a good first step. 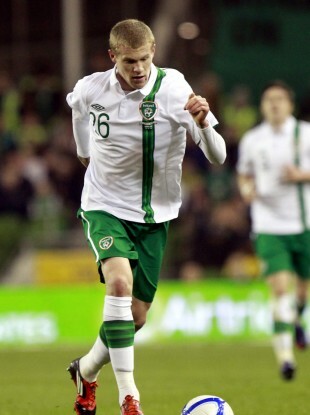 Ireland's James McClean has been the subject of abuse since his decision to play for the Republic. SUNDERLAND MANAGER Martin O’Neill has warned James McClean he shouldn’t react to the continuing unrest surrounding his decision to declare for the Republic of Ireland and subsequent inclusion in the country’s Euro 2012 squad. The 23-year-old, who was born in Derry, was subjected to a torrent of abuse earlier this season after announcing his intention to play for the Republic, despite making seven appearances for the Northern Ireland under-21s. The row escalated this week when the Sunderland midfielder was forced to quit Twitter after receiving abuse following his selection by Giovanni Trapattoni for the Republic’s Euro 2012 campaign. O’Neil said of McLean’s decision: “It didn’t exist in my time, the possibility of playing for either side, and that’s something James has done. O’Neill went on to say that McClean should expect his decision to provoke a reaction but he should ignore the desire to retaliate. Email “O'Neill urges McClean to ignore country row”. Feedback on “O'Neill urges McClean to ignore country row”.